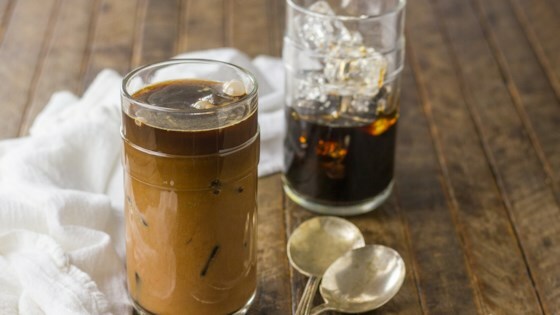 "A spicy twist on a classic iced mocha." Combine the milk, chocolate syrup, and hot sauce in a glass; stir thoroughly until mixed. Place ice in a second glass. Pour cold brew concentrate over ice. Add the milk-chocolate-chili mixture and stir to combine. Be sure to use hot sauce or chili sauce NOT garlic chili sauce. This recipe was developed by this Allrecipes Allstar as part of a campaign sponsored by Gevalia. I added whip cream to this recipe just because it seemed right. It was easy, fun and had delicious results. This Allstar has been compensated for participation in the Allrecipes Allstar Program.